Immunogen: Recombinant fragment corresponding to the carboxy-terminus of human SMN1. Application Notes: Detects a band of ~38kDa by Western blot. 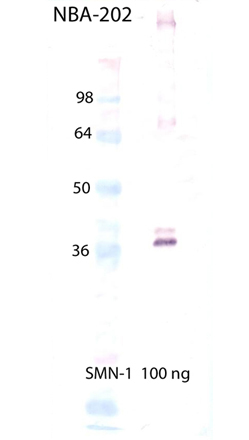 Western Blot Analysis of SMN1, mAb (2B1) (Prod. No. NBA-202). Lane 1: MWM, Lane 2: Empty; and Lane 3: SMN1 (human), (recombinant) (His-tag) (Prod. No. NBP-201).